Stocks measured in dollars are a complete fraud. Stocks are up less than 1% a year (.7% per year) in real silver money over the past fifty years. Sure, in legally counterfeited debt notes the markets are inflated, by counterfeiting, to 6% a year increase plus a 2% dividend, less taxes and fees. The AVERAGE market participant yield is less than 2% a year on stocks. The currency counterfeiting scheme is the greatest financial fraud Ponzi scheme. Wall Street wins. Main Street loses. People who work for or save in debt notes are free slaves. To protect myself I need 50 ounces of gold and 1,000 ounces of silver for each person I want to protect. Winners love wars. Millionaires are inflated to become billionaires. The top 100 wealth holders have more wealth than half the planet? This was all intentional started December 23, 1913 when the Fed was created and it’s all come to pass exactly as planned. Please stop measuring the stock market in fake legally counterfeited debt notes and use real legal US Treasury gold and silver eagles to measure the real economy of the past fifty years. Use reality to measure reality not fantasy to measure reality. John. Please. It appears that you are comparing apples to oranges. 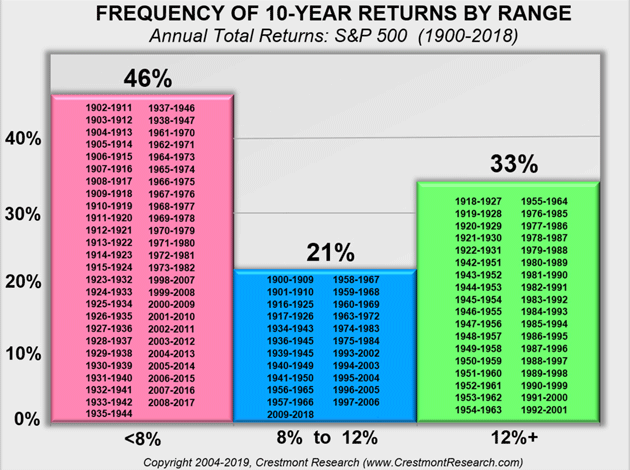 Your article stated a 10% total return; however the table from Crestmont is using principal returns, not total returns. 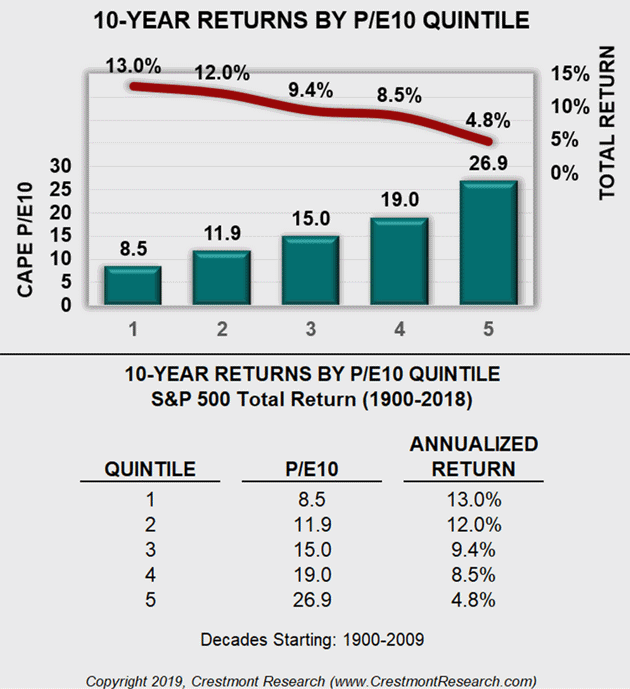 For example the index return from 2009-2018 was 10.75% and the total return was 13.12%. Yet the 2009-2018 period shows up in the 8-12% column. The mark to market rules alter your equation a bit. Like Buffet pointed out, Operating Earnings should be the dynamic that is used to calculate P/E.